Whether you’ve already got seedlings growing away or getting ready to start your annual indoor seed starting, one of the important factors in seed starting is light. (Last month I covered heat, which you can see here). Questions like “Do I need to use supplemental light or can I use a window?” and “What kind of light do I need to use?” are ones we often get from gardeners – new and seasoned alike. So I thought I’d take a little time to talk about light – the factors that are important for plant growth some ways that you can make sure you’re providing the right kinds and amounts of light to your new seedlings. Keeping these ideas in mind can help you choose lights for your seeds starting (or other plant needs), whether it is a simple shop light ballast from the hardware store, a pre-fab light cart system, or even higher-tech LED system. Plants require light for several of their functions, most importantly the process of photosynthesis. The green pigments in plants (Chlorophyll A and B) act as receptors, gathering electrons from the light to use as an energy source to manufacture glucose, which is stored in the plant in a number of ways and then ultimately broken down in respiration to release energy to support plant functions. There are three aspects to light that gardeners should keep in mind for supplemental lighting: quality (color), quantity (brightness/intensity), and duration (day/night length). Duration is a relatively simple concept when it comes to seeds starting and light set-ups. Gardeners will want to try to mimic the natural environment that will be provided by the sun. For the most part, aiming for 16 hours of light and 8 hours of dark is standard. This gives the plant sufficient light, but also provides a rest period which can be important for plant functions. Most gardeners find it handy to invest in timers to turn lights on and off, rather than trying to remember to do it themselves. This can be a simple on-off set up from the hardware store (after-holiday shopping can be a good way to pick them up on sale in the string light section) to something more elaborate from grower suppliers. Duration could be more important if you’re doing longer term growing beyond seeds starting, as day length affects initiating of flowering in some plants. Intensity refers to how bright the lights are. Some lucky people have big windows with lots of bright light for starting seeds, but even for them intensity (and duration) may not be enough during the shorter, grayer days of winter. Growing in bright windows can sometimes be a challenge because the light is coming from the side rather than above, so plants often grow toward the window and need to be rotated. Supplemental light can increase intensity and lengthen duration, even for plants grown in windows. Most commonly, light bulbs are sold by wattage as a measure of their energy (light) output. Standard tube florescent lights are generally around the 40 Watt level, but some of the full spectrum plant lights come in 54W options. If you can find it, the higher wattage can make a big difference in the intensity of light and thus the production of your plants. Even at the higher wattage, you’ll want to get a ballast that holds at least two bulbs (and some grow light ballasts hold more). You can further control the intensity of light reaching your plants by increasing or decreasing the distance between the plants and the lights. This is why the pre-made plant carts have a chain or other mechanism for you to raise and lower the lamps. For fluorescents, lights are sometimes lowered to around an inch above the canopy of the lights. For high intensity LEDs, the distance may need to be more. (If you’re using lights for long-term growth of, say houseplants, you’ll have to experiment with the distance to meet the intensity needs of the plants – closer for high light plants and farther away for low light plants). Sunlight, or white light, is composed of all of the colors of the spectrum. Think back to art class and our friend ROY G BIV – the colors of the rainbow. There’s also parts of the spectrum that we don’t see like ultraviolet and infrared. For photosynthesis, plants mostly use light in the red and blue spectrum (referred to as Photosynthetic Active Radiation, or PAR), though almost all of the colors have some sort of effect or function on plants. Blue light has a role in promoting vegetative growth in plants, while red has a role in promoting flowering. For most applications, supplemental light for seed starting or other indoor growing should be full-spectrum. You can achieve this in a variety of ways – buying specific full-spectrum plant light bulbs is the best, but you can buy non-plant specific full spectrum bulbs as well. For small-scale home growers and beginners, it can be as simple as buying a shop light ballast at the hardware/box store with a full spectrum bulb. For more intensive or large-scale growers, there are lots of sources for higher-end, full spectrum grow lights that you can buy from specialty garden retailers, but these are often more than what home gardeners starting seeds indoors need. These days you might be presented with a choice of lights – fluorescent vs. LED. There are some positives and negatives to each. While they have a higher up-front cost, LEDs use much less energy than fluorescents and can save money over several seasons of use. The reduced energy usage also means there’s less energy loss in the form of heat, which can be a positive if you are always struggling with creating excess heat that burns your plants, but a negative if you’re relying on that heat to help keep the temperatures up (see my article from last month on heat and seed starting) or have issues with drying out your growing media. Fluorescents on the other hand can be more affordable up-front, but have a higher energy usage that will result in higher electric bills over time. You might have noticed in your searching or in visiting some growers that LED lights for plant growth come in either white (full spectrum) or a red/blue combination which end up giving a purple light. Since LEDs give a larger control over the spectrum of light, growers, especially larger scale intensive operations, use these red/blue combinations as a means to add further energy efficiency since it is the blue and red spectra that are the photosynthetic. By eliminating the spectra that are largely reflected rather than absorbed, less energy is used. This is useful in hydroponic and vertical farming systems where short-term crops are being grown quickly and where profit margins can be slim. You can read (and listen to) more about light in the Joe Gardener podcast and article on seeds starting I was interviewed for last year with Joe Lamp’l. However, research has emerged in the last few years that expanding the spectra of light in LED systems increases production. Research has shown that incorporating green LEDs significantly increases production over just red/blue LEDs (some of that research was by Kevin Folta, who is one of the leading science communicators on biotechnology). While green plants largely reflect rather than absorb green light, it does have some effect on plant functions. (Research also shows that adding the green makes the light appear a little more natural to workers in facilities like greenhouses and makes it easier to see issues with the plants – the purple of the red/blue systems washes out the plants and makes it hard to see differences in leaves like diseases). So if you’re looking at LEDs for seeds starting, and especially if you’re looking at them for longer term indoor plant growing, stick with full spectrum or explore one of the LED systems that incorporates green. 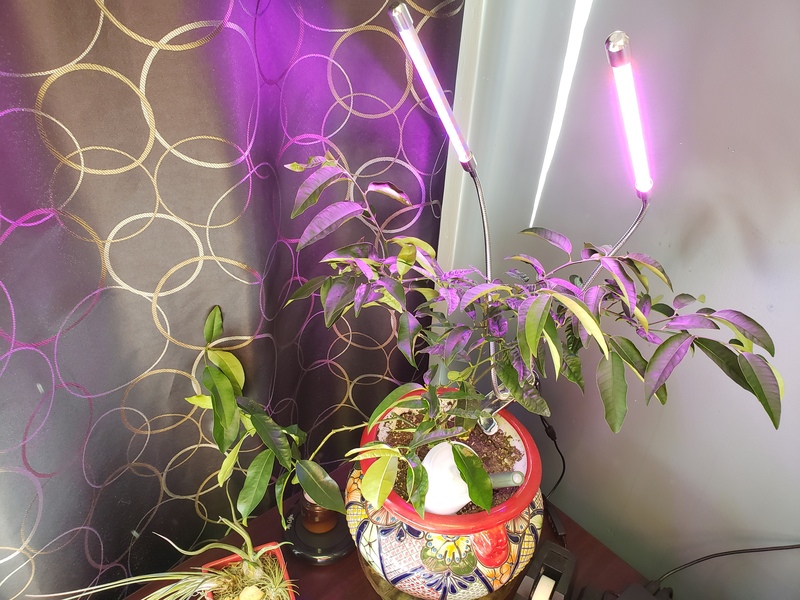 Though don’t be afraid to experiment with the colorful LED options – I have a small red/blue system to suppleme nt light to my office potted lime. The key is to experiment and shop around – every gardener’s need for supplemental light is different and the solutions to those needs are different. 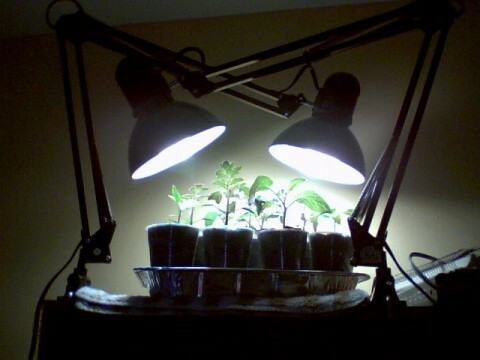 Don’t be afraid to start small with that shop light from the hardware store before working your way up – especially if you’re just starting a small amount of seeds in the spring. In most parts of the country it is time to dust off the seed starting trays, pick out your favorite seeds, and get a little plant propagation going on. There’s definitely a lot of science (and perhaps a bit of art) to successful seed starting. While the process starts (and relies on) the imbibition of water, one of the biggest factors that affects the success, efficiency, and speed of seed germination and propagation is temperature. Germination relies on a number of chemical and physical reactions within the seed, and the speed and success of those reactions is highly temperature dependent. Respiration, where the seed breaks down stored carbohydrates for energy, is probably the most notable process involved that is temperature dependent (source). Think of it in terms of a chemical reaction you might have done back in your high school or college chemistry class – there’s an optimum temperature for the reaction and any lower and higher the reaction might slow down or not happen at all. Thinking of it this way, seeds and germination are just like Goldilocks and her porridge – there’s too hot, too cold, and “just” right. Seeds are the same way – there’s a “just right” temperature for germination. The seeds of each species has a different optimal temperature for germination with a range of minimum and maximum temperatures for the process. Why is important that seeds are started at their optimal temperature? The optimal temperature is the one at which germination is the fastest. This may seem to only have consequences for impatient gardeners, but slower germination speeds increase the days to emergence for the seeds, which in turns means that the seeds and seedlings have a greater chance of failure. The early stages of germination are when seedlings are most susceptible to damping off, which can be caused by a number of fungal pathogens (Fusarium spp., Phytophthera spp., Pythium spp., etc.) that basically cause the seedling to rot at the soil level. These pathogens (as well as decomposers in some cases) can cause seeds to rot or decompose before emerging as well. That’s why you’ll sometimes see seeds that are slow to germinate (or traditionally direct sown like corn, beans, and peas) treated with those colorful fungicides. The fungicide gives the seed and seedling a little bit of protection (for a week or so, depending on the product), which is handy if you accidentally sow them before soil temperatures are optimal or if the species is slow to germinate. If emergence is really slow, there’s also the possibility of stunting or failure due to exhaustion of the stored carbohydrates that the seed relies on until it begins photosynthesis. So the closer to the optimal temperature the seed is, the faster the emergence and the highest percentage of germination success. What does this mean for home gardeners? Whether you are starting seeds indoors or direct sowing outdoors, knowing the germination temps can help increase your likelihood of success. You can find a variety of resources for the optimal germination temperature for your selected crops. In general, most warm season plants, like tomatoes, peppers, and summer flowers are in the 70-80 °F range. This is why most of the warm season crops are started indoors – so temperatures can be controlled to higher levels. For vegetable crops, here’s a good resource for basic germination temperatures. And here’s one for a few annual flowers. Many of the cool season crops germinate at much lower temperatures, which means many of them can be directly sown early in the season rather than started indoors. 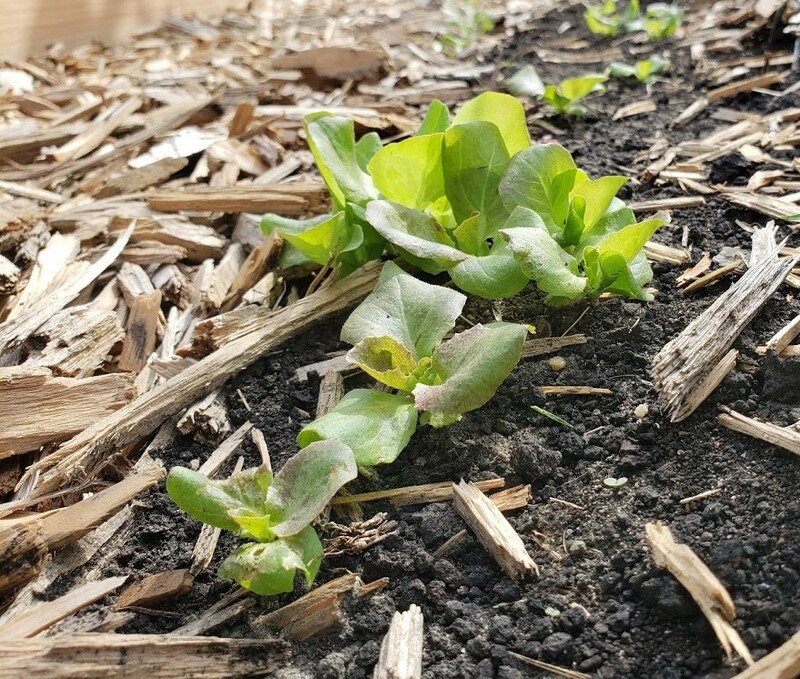 Crops such as spinach, lettuce, and other leafy greens have these lower germination temps and typically perform better if germinated at lower temps. It should be noted that this is for the soil temperature, not the air temperature. If you’re starting seeds in your home, most people don’t keep their homes in the 75 – 80 degree range in the winter. Many commercial operations use warmed tables or beds for seed starting, rather than heating the whole facility to the necessary temp – it would be expensive. For home growers, supplemental heat mats can help increase soil temp without having to heat a whole room. In a pinch, you can even clean off the top of your fridge and keep seedlings there. It is higher up in the room (heat rises) and most refrigerators create some amount of external heat as they run. For any seeds that you’re direct sowing outdoors, whether they require higher or lower germination temperatures, you’ll have more success if you plan your sowing around soil temperatures rather than calendar dates (planting calendars can be good for estimation, though). Investing in a soil thermometer can offer detailed information on the specific temperatures in your garden soil. Or, if you have a good weather station nearby many of them have soil temperature probes that could give you a good idea of what the soil temperatures are in your region. But don’t let the cool/warm season crop designation fool you – the Cole crops like cabbage and broccoli actually have an optimal germination temperature on the warmer side, but grow better in cooler temperatures to keep them from bolting (flowering). This is why they need to be started indoors for spring planting, but you can start them outdoors (even trying direct sowing) for fall crops – they germinate in the heat and then slow growth as the temperatures drop. Compost in Seed Starting Mix: Recipe for Success….or Failure? A recent question posted to the Garden Professors blog Facebook group (a place where you can join and join in conversation of garden science) asked about the potential for compost added to seed starting media to cause failure in germination. It is a good question, and one that seems to have several different camps – from garden hero author folks swearing by it in their (non-peer reviewed) books, to fact sheets saying it isn’t a good idea. I’ve always promoted that the best practice for seeds starting is using a sterile media to avoid such problems as damping off. Many of the problems I’ve heard associated with compost and seed starting are that improperly finished compost can introduce disease microorganisms to the media or cause phytotoxicity, it can make the mix too heavy and thus create anaerobic conditions that starve emerging seedlings of oxygen or cause decomposition, and there is the potential for residues of herbicides in composts using farm waste, manure, or lawn clippings as a feedstock. But does compost really pose a risk to seed starting? I decided to take a very quick spin through the literature to weigh the possibilities. Here are some of the potential issues and what a quick glance at the literature says. Compost, even finished compost, has a high microbial activity. For the most part, the fungi and bacteria in compost are good guys that pose no threats to plants, they decomposers or neutral. But incorrectly managed compost can also harbor fungi such as Pythium and Rhizoctonia that cause damping off or even other diseases such as early and late blight if diseased plants were added to the compost and sufficient heat levels weren’t maintained. Composts that don’t reach 140°F and maintain that temperature for several days to kill off potential pathogens run the risk of introducing diseases into seedlings. Many promote the use of compost and compost products for potential antagonistic effects on bad bacteria. We’ve discussed compost tea and the lack of conclusive evidence that it has any effect on reducing disease here many times before, and this article found that there is no significant effect of compost tea on damping off. Some other articles, such as this one, did find that commercially prepared composts added to media did suppress damping off. However, it is to be noted that these are commercially prepared composts, which have a strict temperature requirement and often require testing for pathogen and bacterial populations. Many home composters aren’t as proficient at maintaining temperatures suitable for pathogen elimination. Even if the compost is pathogen free, introduction into a germination media could potentially increase the population of pathogens already present in the media (or that land on it from the air) by providing a source of food for bacterial and fungal growth. The sterile mixes aren’t just sterile from a microorganism perspective, they’re also sterile from a nutrient perspective as well to help inhibit potential pathogen growth. The seeds come with their own food, so it isn’t needed for initial germination – the seedlings should be moved to a more fertile mix once they’ve established their first set of true leaves. You may be saying- “but we also direct sow seeds outdoors, where there’s lots of pathogens present in the soil.” While this may be the case, damping off is still a definite problem in direct sowing and the loss of investment in materials, lights, and time is generally much lower (and less painful) than in indoor seedling production. This is especially the case for large operations or for home gardeners who grow lots of stuff from seed. This is the main issue that leads to the best practice recommendation to use a sterile seed-starting mix that doesn’t contain compost. If a mix contains compost, it should be from a commercial enterprise that follows best practices or pasteurized. Continuing to talk about proper composting, improperly finished compost that hasn’t properly matured (finished composting) can also lead to problems with seed germination. Unfinished compost can still have woody material included, which has a high C/N ratio and also contain/release phytotoxic compounds during the decomposition process. The presence of decomposition microorganisms in a high C/N ratio means that there is still decomposition happening, which requires nitrogen for the process. With absence of nitrogen in the media, the nitrogen from the seed or the seedling can be leeched out, effectively causing mortality after or even before germination. 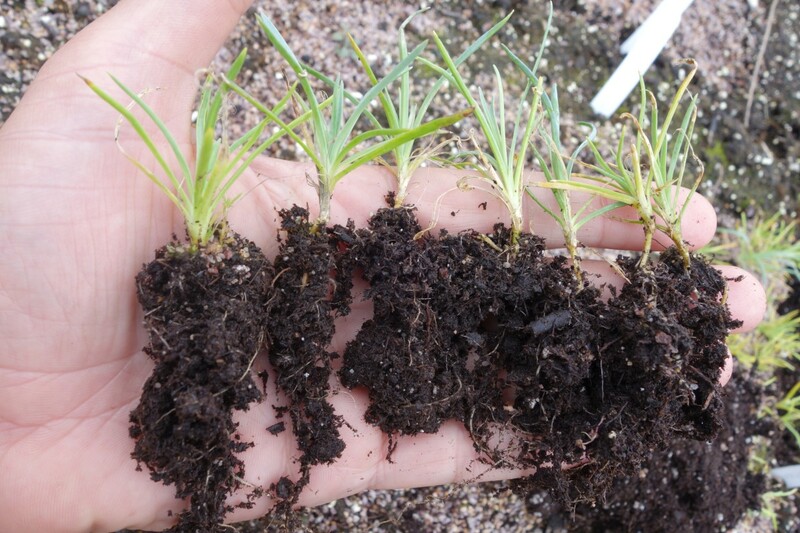 The tender seedling serves as a source of N for the decomposing fungi. We’ve had this discussion before when it comes mulch. While mulch is perfectly fine on top of the soil, if it gets mixed into the soil there could be potential implications on N availability. 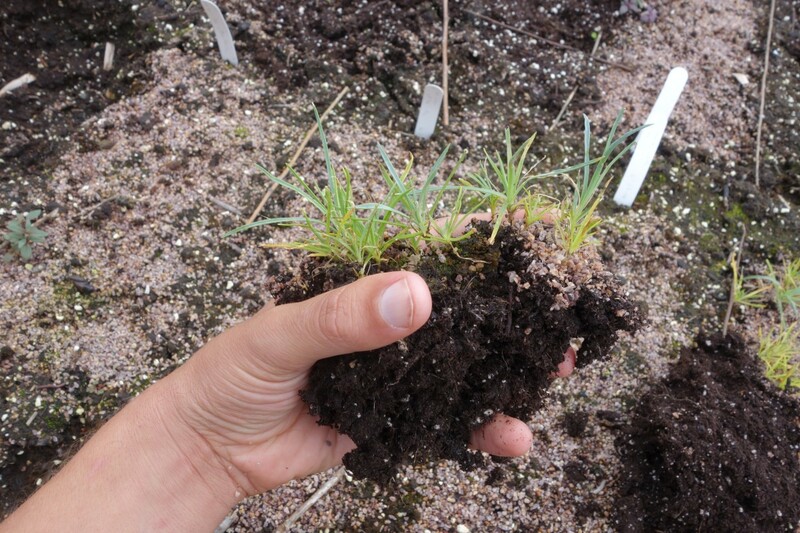 A germination bioassay is one tool commonly used to test for compost maturity. Quickly germinating (and inexpensive) seeds are germinated on the compost (or on filter paper soaked with an extract from the compost in some commercial operations). The rate of germination vs germination failure can give some insight into the maturity of the compost. This paper discusses the use of the technique for commercial sawdust compost used for potting media. You can use a bioassay of your own to test for compost maturity (or herbicide persistence, discussed later) for applications in your garden. Sow an equal number of inexpensive, fast-germinating seeds like radish or lettuce sown on the compost with a control sown on moist paper towel in a bag. Compare the number of germinated seeds and thriving seedlings after several days to see if there is an issue with the compost. One other quality required for seed starting media is a good level of porosity (pore spaces) for the media to hold air. Air (oxygen) is important as it is needed by the roots for respiration. If the media is too heavy or holds too much water you run the risk of hypoxia, or lack of oxygen, in the roots. This can result in root die off and subsequent seedling failure. 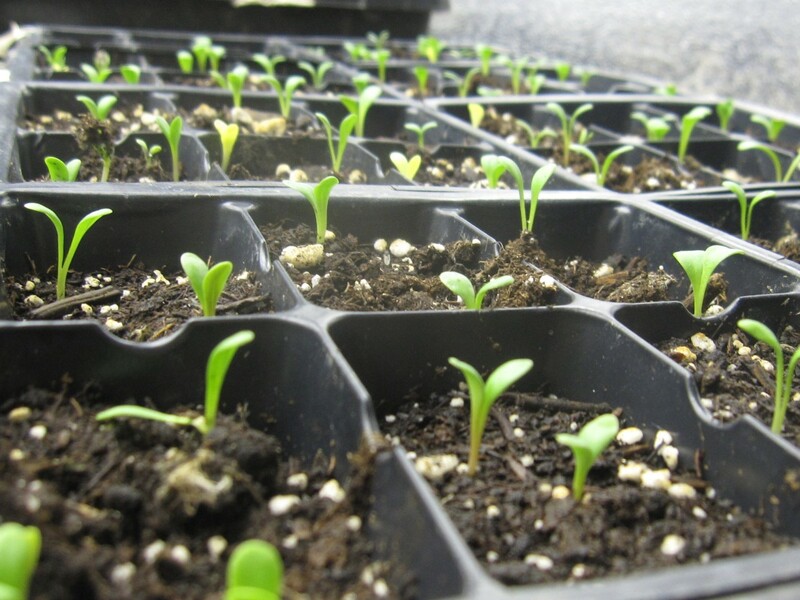 Most seed starting media are composed of very light materials such as peat moss, coir, vermiculite, or perlite for this very reason. Compost, by nature, is a more dense material with less porosity and has a higher water holding capacity. Therefore incorporation of too much compost can create the potential risk of compaction or excessive water holding in the mix. Most herbicides break down during the composting process through a variety of physical and biological interactions. However there have been reports of some herbicides that are persistent after the composting process, resulting in a residue that could damage plants grown using the compost (see this paper for some examples). Many of the reports show the damage manifesting in mostly large applications of compost to gardens. However, the more fragile nature of germinating seeds and young seedlings make them especially susceptible to herbicide residue damage. For further discussion (and examples of bioassays used to detect herbicide residues), check out this paper. So the potential for pathogens, risk of improperly matured compost, effect on porosity, and potential for herbicide persistence present some significant risks to germination if they are incorporated into seed starting media. These are the risks that cause many sources to promote using sterile seeds starting media, and I think the advice is well founded. While some may not experience these possible issues, the potential is still there. Posted on January 18, 2019 January 18, 2019 Author John PorterCategories John Porter, propagation, VegetablesTags compost, germination, seed starting8 Comments on Compost in Seed Starting Mix: Recipe for Success….or Failure? Two desk lamps with compact florescent bulbs. Not traditional, but worked great. Just a reminder that you can get creative when it comes to lighting for seedlings, using whatever fixtures and layout works for your space. The only rules are to use florescent or LED bulbs, not those old fashioned incandescent bulbs which have poor light for plants, and err on the side of more light rather than less to make sure you get compact, healthy plants that will transition to the sunny outside world without drama. As a beginning gardener I learned that to give plants like tomatoes and peppers more time to grow and produce the largest possible crop, it was best to start the seeds early indoors. As soon as I learned that, I wondered: Well, if starting my tomatoes 6-8 weeks before transplanting them outside is good, surely 10 weeks would be better, right? Or 12? Or 16? Turns out, earlier isn’t always better, and here are some of the reasons why. First, you probably don’t have enough light. If, like most home gardeners, you are starting seeds under florescent bulbs, it is difficult to give sun lovers like tomatoes and peppers enough light. Light intensity drops off rapidly as you move away from the bulbs, so you know to keep the bulbs right above your seedlings. This works great when the plants are small, but as they grow it becomes very difficult to give both the tops and the bottoms of the seedlings enough light. The result is dying lower leaves and spindly, unhealthy growth. Secondly, you are almost certainly going to get some crappy root systems. If you’ve followed this blog for a while, you’ve no doubt read Bert and Linda talking about all the potential problems with the root systems of container grown trees and shrubs. Well, most of the same problems develop with other plants grown in small containers. The roots start circling and they are slow to grow out of the rich soil of the container and into the native soil around them once transplanted into the garden. 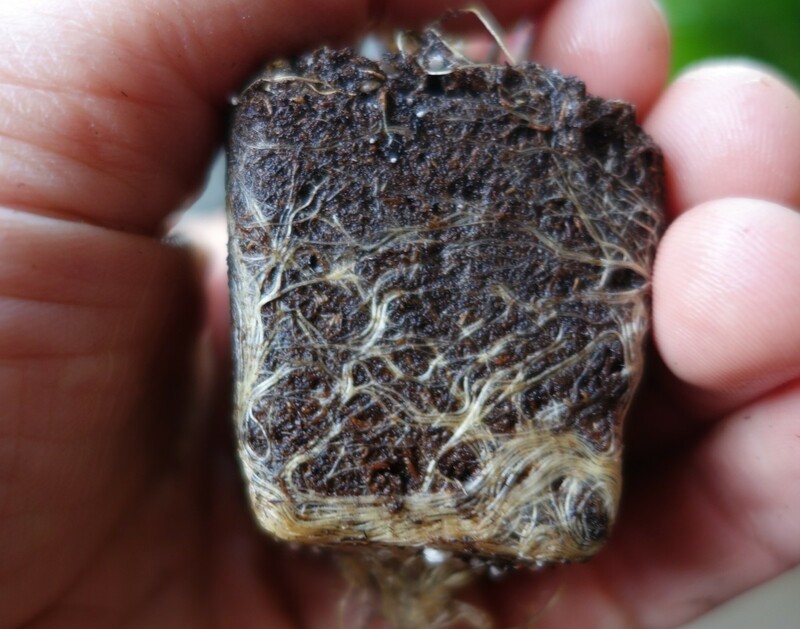 The longer your transplants grow indoors, the more likely they are to develop problematic root systems. 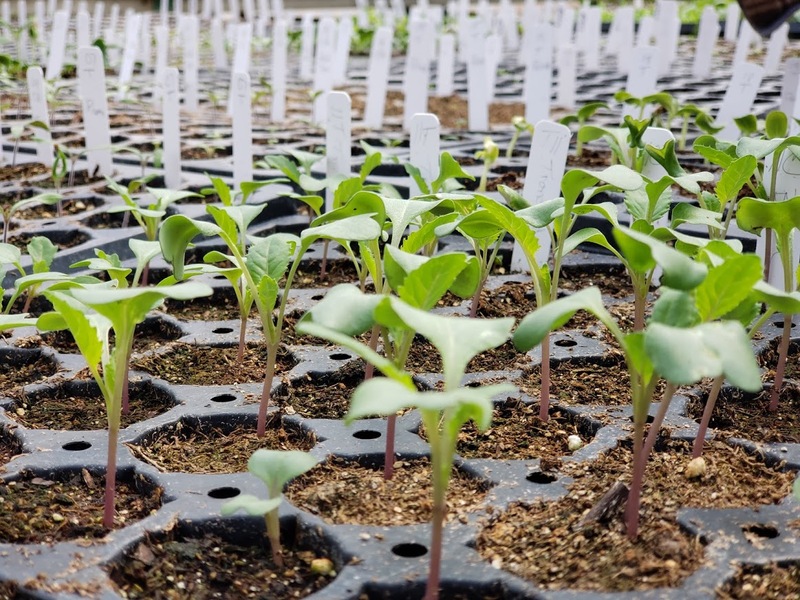 Keeping transplanting them up to larger and larger containers can help mitigate the problem, but that quickly takes up far more space than most home gardeners have for there seedlings. How big and impact that circling root system will have on the health of the plant varies by species. My personal experience growing zinnias, for example, is that they handle circling, pot-bound roots so poorly that plants from seeds sown directly in the garden quickly over-take and out-perform plants started weeks earlier indoors. So follow the recommendations for the timing of seed starting. It really does work better. You should be able to get advice on when to start seeds from the catalogs you are shopping, extension offices, or you can use Margaret Roach’s excellent seed sowing calculator. If you DO decide that earlier is better, that you can provide the light and generous pot sizes to avoid problems, there’s no harm in giving it a shot. But if you do, try starting a second batch at the later, recommended, time and growing the two side-by-side in the garden so you can really compare and see which perform best in the actual conditions of your garden, and if all that extra time and space under your lights or in your greenhouse was really worth it. You may think of spring as the time for seed sowing, but I do a lot of seed planting now, in the fall. The reason is that most of the cold hardy perennials, trees and shrubs that I like to grow produce seeds that require cold stratification. This simply means that they require a period exposed to cold temperatures while the seeds are moist and hydrated before they will germinate. The requirement for cold is a pretty straight-forward adaptation to life in cold climates. Seeds that ripen in the summer and fall might not have time to get established before winter if they germinated right away. The requirement for cold means the seeds don’t actually sprout until spring, giving them a full growing season to get ready for the next winter. You can — and I used to — give seeds this cold period in the refrigerator. Three months in the fridge in a plastic bag with a damp paper towel to keep the seeds moist is long enough for most everything, though the exact period of cold required varies by the plant. The fridge works, but I think it is way easier to just do it outside. So the past few days I’ve been busy sowing seeds out in my outdoor seed beds. 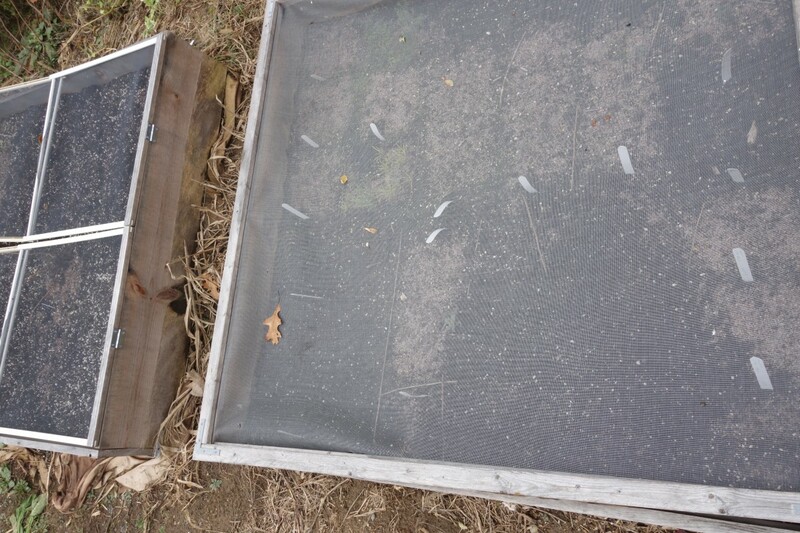 They’re just raised beds, filled with potting media, and covered with a screen lid to limit the number of weed seeds that blow in and keep disruptive animals out. I plant my seeds in the fall. Come spring, after the seeds have had their dose of cold, they sprout. Once the seedlings have grown on a while, I dig them out, separate the individual plants, and put them out into their final locations in the garden. I do this with more and more seeds every year, even for perennials that don’t require a cold period to germinate, simply because it is so easy. No fussing around with lights or checking the calendar or even much watering. Just plunk the seeds in, and dig out the plants once they are big enough. 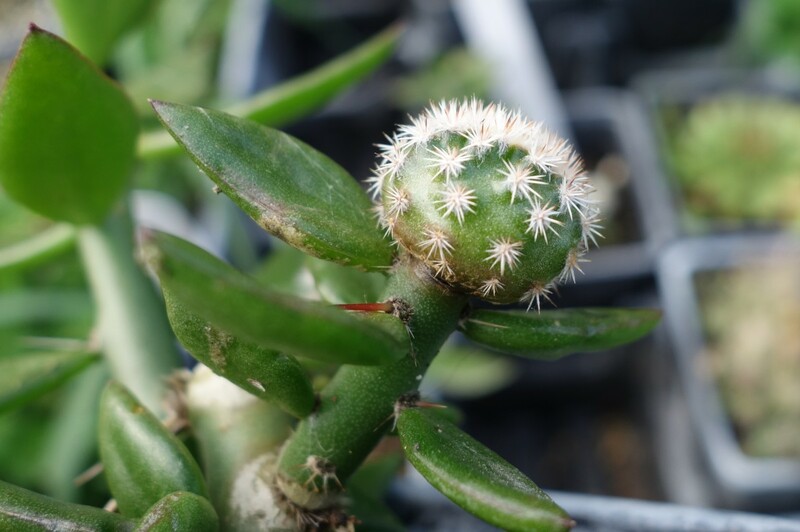 It is a seedling of the gorgeous hardy cactus Echinocereus reichenbachii, grafted onto Pereskiopsis spathulata, an odd, leafy cactus I wrote about earlier. Why do this? Other than the fact that it is darn cool? Well, because that vigorous, fast growing rootstock pumps a lot of energy into the cactus grafted on top, making the grafted cactus grow a LOT faster than left on its own roots. This is a (terrible, blurry) picture what the graft looked like when I first made it back in July. Just three months later it has grown to enormously, while the seedlings I left on their own roots look pretty much the same. I’ll let it grow on the graft for a while, then probably next year some time, cut it off, and move it into the garden, getting me to a reasonably sized plant in a reasonable amount of time. So… if you want to speed up the growth of a pokey cactus, try grafting it. The process is crazy easy, lots of fun, and very thoroughly explained here.